Happy Thanksgiving week! Give a warm welcome back to J as he makes an appearance in today's post. We are excited to showcase some Thanksgiving styling tips and outfit ideas today, thanks to a few pieces from our latest Stitch Fixes. 1. Wear fall colors. There is no time better than Thanksgiving to pull out your best fall outfit and really embrace fall shades. I did an entire post on my favorite fall shades a few weeks back. The cliff's notes version: If it's a shade that the leaves are, it's probably pretty great for the fall. Add shades like rust, mustard, olive and burgundy into your look. 2. Dress up your everyday pieces. None of these pieces are overly dressy, however they are slight upgrades from what either of us might wear on a typical day. Rather than wearing jeans and a tee, J chose to style his mustard chino pants and a woven button down. He still felt comfortable but he looks way more put together for a family occasion. I opted for white jeans over typical blue denim for a more crisp look. A berry lip by Giorgio Armani (my new favorite lip color) finished off my look. 3. Play with textures. There's no better way to add interest to an outfit than by mixing up your colors & textures. I decided to pair a faux fur vest over my sweater and accessorize with a suede clutch and leather boots. Simple layers and the addition of some differing materials make basics much more interesting. PS. Holiday gift alert: Stumped on what to buy the person who has everything? Stitch Fix & Stitch Fix Men offer gift cards so you can give them the gift of a personal stylist and new clothing/accessories tailored to their style! Say hello to our Start The Week Stylish link up guest host for this week: Amanda from Truly Yours, A. Amanda is a Virginia based blogger who shares her lifestyle, fashion tips, DIY projects, travel adventures and photography on her blog. Be sure to stop by this week and say hello! 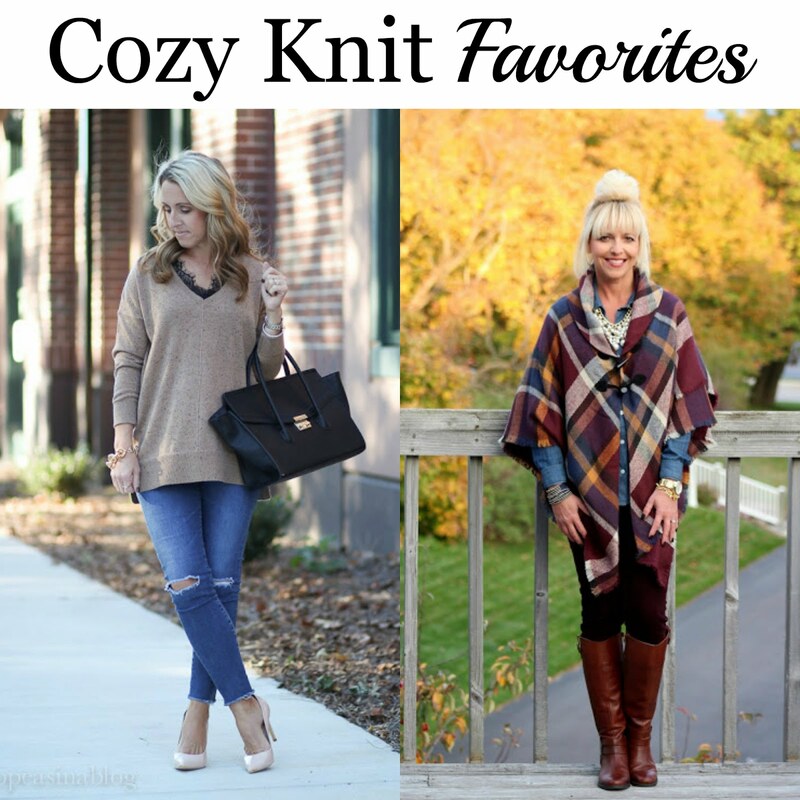 Last week, we loved the way Betsy from Two Peas in a Blog & Andrea from Living on Cloud Nine styled their cozy sweaters. This post is done in partnership with Stitch Fix. All thoughts/opinions are my own. You both look SO great! Loving the colors. Happy Thanksgiving!! Great photo of the two of you! Sometimes my husband and I accidentally wear the same colors----I usually have my outfit picked out first, so I blame him!! You look fabulous---I may wear my fur vest for T-Day too! How cute are you two?!! 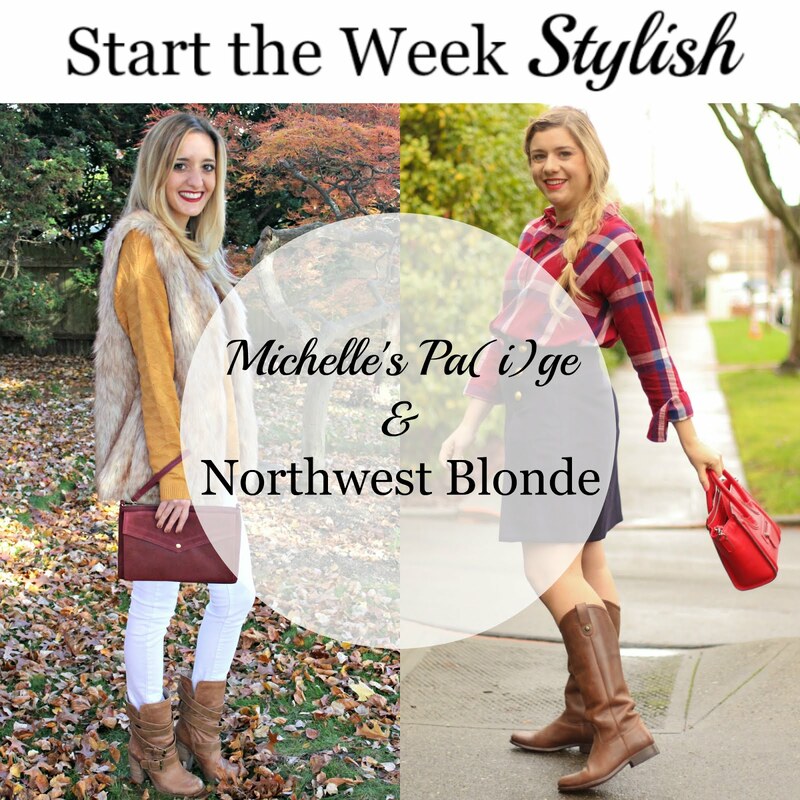 Love the pairing of your fall colors, and that vest is gorgeous on you! You two are so precious! I love the colors, I love your furry vest and I hope you have the best Thanksgiving ever! Love the mustard and fur vest combo! You guys are too cute! Loving both of your holiday looks! 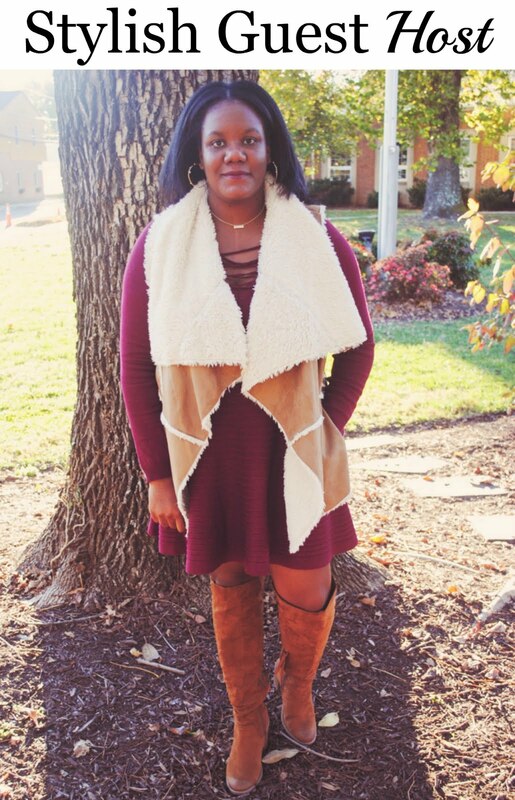 The colors are perfect for Thanksgiving, and I love that vest! You both look so great! Love how you match and the Fall colors are so perfect. Beautiful looks Michelle! May God bless you, my friends! We are grateful for His ever present merciful love in our lives! From the south of Brazil, a happy and holy Thanksgiving! By the way, you're absolutely charming in this look. Very elegant, with that rural and country atmosphere that I really appreciate (and I use myself, as you know, since you visit my blog and you know my work). I loved the white skinny jeans, the fur vest and the booties. The color of the blouse was perfect too. Great combination! Yes - I love using nature as my background. It creates such a nice back drop. Thank you for your sweet wishes! Could you two be ANY cuter? I love the mustard color, perfect for Thanksgiving! That fur vest is darling, too! I need to get mine out again! You guys match! How cute! Great colors! Very kind of your Mr. to join! You both are looks great! Aww. you guys look so cute together! Love that sweater with the light fur vest! Such a cute outfit! Have a great Thanksgiving! You guys look so good- I love how you coordinate without full-stop matching! I love the his and her idea for a post! Your vest is so cute! You two are so cute! I just bought a fur vest from Maurice's and I'm so excited to rock it this fall! You make such a lovely couple! Great colours for autumn/fall. I love the faux fur gilet. You guys are so adorable! I love the coordinating outfits!